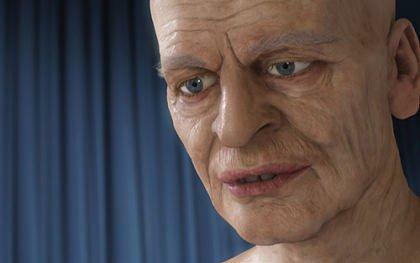 “Our R&D group had a very strong focus on the development of tools for facial animation during 2003-2006. The Kinski Revisited project was initiated to test drive the technology towards its use in a VFX production to see if it could be used to replace a real actor’s face with a digital version. Nowadays digital actors in movies are more common with projects like Benjamin Button and Tron – however, when we started the Kinski Revisited project in fall 2006 this topic was only addressed by a few individuals /companies with extreme caution. This is very true – it seems to be impossible to find. However, I have found a couple of photographs of an earlier version of the Klaus Kinski model on the Stern website (http://www.stern.de/digital/computer/computeranimation-klaus-kinskis-auferstehung-588439.html), which were used to illustrate an article about the project back in May 2007. Of course they don’t do the VFX trailer justice, but it gives you an idea of what Klaus Kinski might look if he were still here today! But all is not lost for Volker Helzle and his team as in a few months’ time they will begin working on a next generation technology test. They will be working on new production workflows introducing a dedicated sensor technology. I believe that this means they will be taking the facial movements of an individual and applying them to a CG model on a computer to make virtual actors (or vactors / synthespians), animating in real-time on a games engine, and then building on top of this by working with coding they have written themselves to create a workflow. Phew! That’s the techy stuff out of the way… But it’s bound to be very different to the Kinski Revisited project, and, sadly, won’t be featuring Klaus Kinski. Nonetheless, I feel privileged to have seen Kinski Revisited and hope that the feature film meets with huge success for the Filmakademie R&D Team. And if it does, who knows, maybe Werner Herzog’s people will reconsider and bring Klaus Kinski back to life for one more collaboration? After all, surely a CG Kinski would not be as temperamental as the real one?! 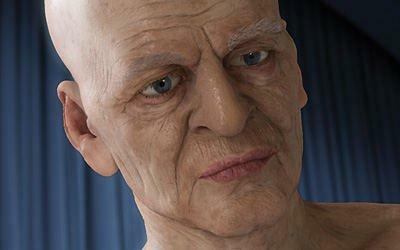 I must admit that when I heard about there being a 3d Klaus Kinski, my first thought was: Can I get to interview him? (I should be so lucky) But now I’ve seen Kinski Revisited, I’m wondering how I can get my hands on one of Jan Ptassek’s lifelike Kinski models! And if you think a virtual-Kinski would not do it for you, google Kyoko Date, who was one of the first Virtual Idols to come out in Japan in 1997 complete with a fabricated back-story and discography. If Kyoko Date can have her own fabricated back-story, so can virtual-Kinski – at the end of Kinski Revisited it states that Klaus Kinski made many more films until the year 2098 when his data was destroyed by a computer virus! If you are interested to find out more about the software they have developed at the Filmakademie, visit http://research.animationsinstitut.de where you are able to download the software free of charge for educational purposes. Thanks to Saint John Walker for telling me about the 3d Kinski rumours and many, many thanks to Volker Helzle of the Filmakademie for taking the time and trouble to meet up with Du dumme Sau!, for showing me the Kinski Revisited film “for research purposes” and for telling me about the project in more detail. This entry was posted in Other Kinski Stuff and tagged Filmakademie, Filmakademie Baden-Wuerttemberg, Jan Ptassek, Kinski Revisited, Kinski Uncut, Klaus Kinski, Klaus Kinski 3D, Volker Helzle, Werner Herzog. Bookmark the permalink.